Khorana was one of the first scientists to demonstrate the role of nucleotides in protein synthesis and helped crack the genetic code. He also helped develop custom-designed pieces of artificial genes and methods that anticipated the invention of the polymerase chain reaction (PCR) process, a biochemical technology used to amplify a single or a few copies of a piece of DNA. 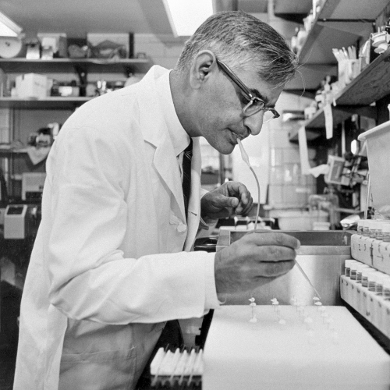 Har Gobind Khorana was the youngest of five children, one girl and four boys. His parents were Hindu and lived in Raipur, a small village inhabited by 100 people, that is based in the Punjab, a region allocated to Pakistan after the partition of British India. It was here that Khorana was born. Khorana's father, Ganpat Rai, was a patwai (village agricultural taxation clerk) who worked for the British Indian government. While very poor, Khorana's father strove to educate his children to the highest standard. Not only did he teach them to read, but he also established a single-room school in the village. As a result Khorana and his siblings were among the handful of literate people in the village. During his childhood Khorana woke early every morning to hunt for an ember to light the cooking fire at home. This he did by searching for a house in the village with smoke coming out of its chimney. It was also common for him to sit on the steps of the post office transcribing letters for illiterate villagers. In 1952 Khorana married Esther Elizabeth Sibler, a Swiss woman whom he had met in 1947 when visiting Prague. Khorana greatly valued the stability Esther brought into his life, having spent the previous 6 years living away from his family and home country. Esther introduced him to Western classical music which he developed a passion for and their home was filled with paintings and many books on science, art and philosophy. Khorana also had a deep interest in nature and regularly went hiking and swimming. Often he would use the solitude of long walks to think through scientific problems. He and Esther had three children: Julia Elizabeth (born 1953), Emily Anne (born, 1954; died 1979), and Dave Roy (born 1958). They were all born in Canada. Khorana was known for his great modesty and humility and he did not like publicity. He became a naturalised US citizen in 1966. Khorana received his first four years of education from a village teacher while sitting under a tree. After this Khorana attended D.A.V. High School in the near-by city of Multan (now West Punjab) and then applied to study English literature and chemistry at the Government College in Lahore which was affiliated to Punjab University. In the end he decided to study chemistry and received his bachelor’s degree in 1943. Two years later he had completed a a master's degree at the same institution. In 1945 Khorana gained a Government of India fellowship to undertake a doctorate in England which he intended to use to study insecticides and fungasides. He landed up, however, studying the chemistry of melanins under the supervision of Roger J.S. Beer at Liverpool University. It was the only doctoral placement the Indian High Commission office in London could find him. Khorana completed his doctorate in 1948. From early on Khorana did not stick to the rigid boundaries of disciplines and his work was to take him across the fields of chemistry, biology and physics. This was unusual for scientists of his generation. Whenever he undertook a new project Khorana secured time in other laboratories so that he could master the techniques he needed to carry an idea forward. As soon as he finished his doctorate, based on the importance of German scientific literature, Khorana decided he would benefit from pursuing his post-doctoral research in a German-speaking country. To this end he spent 11 months in Zurich between 1948 and 1949 at the Organic Chemistry Laboratory at the Swiss Federal Institute of Technology (ETH) where he researched alkaloid chemistry with Vladimir Prelog. Khorana greatly valued the philosophy and work ethics Prelog passed on to him during this time. Khorana unfortunately had to cut short his visit to Switzerland because he had no stipend and his savings were running out. Thereafter, Khorana returned to the Punjab in order to fulfil the requirements of his Indian government scholarship. He found it difficult, however, to find a job because of the upheaval caused by the recent partition of British India. What came to his rescue was the offer of a fellowship at Cambridge University. This he secured through the help of the Cambridge based scientist G.W. Kenner whom he had met in Zurich. In 1950 Khorana returned to England with money scraped together by his extended family to pay for his ship's passage. Over the next two years Khorana worked alongside Alexander Todd trying to define the chemical structures of nucleic acids. This was an exciting time to be in Cambridge because Fred Sanger was then in the process of sequencing insulin, the first protein to be sequenced, and Max Perutz and John Kendrew were performing the first x-rays of myoglobulin and haemoglobin. Such work inspired Khorana to start looking at proteins and nucleic acids. In 1952 Khorana was offered a position in Vancouver to start a new non-academic research laboratory based on a recommendation by Todd to Gordon M. Shrum, head of the British Columbia Research Council. While the laboratory in Vancouver had very little in the way of facilities, Khorana treasured the freedom the job gave him to pursue his own research. He soon launched a number of projects researching phosphage esters and nucleic acids. Such work necessitated him developing methods to synthesise short oligonucleotides. His publication of these techniques soon attracted the attention of notable biochemists, such as Arthur Kornberg and Paul Berg, who were eager to visit him to learn from him and gain his reagents. In 1960 Khorana moved to the Enzyme Institute at the University of Wisconsin-Madison where he began working on the genetic code and chemical synthesis of a transfer RNA gene. During this time he and his colleagues determined how the synthesis of proteins is controlled by nucleotides in nucleic acids. In 1970 Khorana transferred to the Massachusetts Institute of Technology where began investigating the molecular mechanism that governs the cell signalling pathways of vision. This was a topic he pursued until his retirement in 2007. In 1968 Khorana was awarded the Nobel Prize for Physiology or Medicine with Marshall W. Nirenberg of Cornell University and Robert W Holley of the National Institutes of Health. This they were awarded for their elucidation of the genetic code and its function in protein synthesis. Khorana's work confirmed Nirenberg's finding that the chemical compositioon and function of a new cell is determined by how the four nucleotides are arranged on the spiral 'staircase' of a DNA molecule. He also demonstrated that the nucelotide code is always transmitted in groups of three, called codons, and that these codons instruct the cell to start and stop the production of proteins. Khorana was also one of the first to outline the possibility of gene manipulation. This he did before any individual genes had been characterised from any organism. Khorana is also credited with having devised techniques for the creation of synthetic DNA oligonucleorides, which provided a building block for the creation of artifical genes and primers and templates for DNA polymerase. This work laid the foundation for the development of the polymerase chain reaction (PCR), a technique that enables the amplification of small fragments of DNA to billions of copies within a matter of hours. In 1976 Khorana and his colleagegues at MIT achieved the first synthesis of an artificial gene in a living cell. Their method of chemically synthesing genes helped facilitate controlled, systematic studies of how genetic structure influences function. Alongside his Nobel prize, Khorana was awarded the Louisa Gross Horwitz Prize from Columbia University and the Lasker Foundation Award for Basic Medical Research in 1968; the Willard Gibbs Medal of the Chicago section of the American Chemical Society, in 1974; the Gairdner Foundation Annual Award, in 1980; and the Paul Kayser International Award of Merit in Retina Research, in 1987. In 2007 the University of Wisconsin-Madison, the Government of India and the Indo-US Science and Technology Forum founded the Khorana Program in Khorana's honour to facilitate the exchange of students between the university and Indian research institutions.